There’s no better use for leftover rosé from the summer season than this steamed clams recipe! You can use any white wine as well, but September is the perfect month to soak up the last drops of rosé while also staying warm on brisk nights with a steaming bowl of clams. Adapted from Simply Fish by Matthew Dolan. Place the clams in a colander and rinse thoroughly with cold water. Transfer to a large mixing bowl and cover with cold water. Allow to soak for 10 minutes while you begin prepping your meal. Right before you’re ready to cook, remove the clams with your hands and return them to the colander. It’s important to leave the sandy water in the bowl! In a large saucepan with a lid, heat the oil. Sauté the leeks, shallots and garlic over medium heat until translucent, about 5 minutes. Add the butter and season with salt. Add the clams to the pot and stir for 30 seconds. Pour in the wine and stand at attention! Simmer the clams over medium heat and the second one opens, pluck it from the pot to a serving bowl. 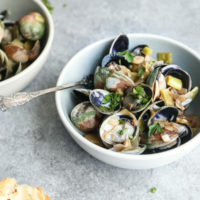 Once all the clams are out of the pot, and any that don’t open are discarded, add the lemon juice and oregano or parsley leaves to the cooking liquid. Pour the sauce over the clams and serve with crusty bread on the side. My favorite gluten-free baguette for serving is this one.